17th of May is the National Day of Norway and celebrates the day Norway got its own constitution, in 1814. 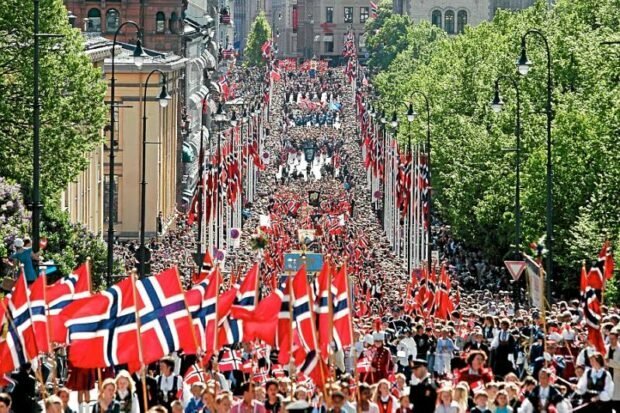 It is a day where Norwegians parade around wearing woollen dresses and wave flags whilst eating hot dogs and ice cream. From early 1400s to 1814, Norway was in a union with Denmark where the Danes had most of the say (this period is often referred to as the 400-year night in Norway). In 1814, following the loss of the Napoleon war (King of Denmark was allied with Napoleon) Norway was taken from Denmark and gifted to Sweden. This union lasted until 1905. In other words, Norway is a historically young country and the national day is celebrated greatly across the country. It’s a big deal – and Norwegians are generally very patriotic. So.. How do I celebrate it? You need a bunad. If you haven’t got one, your finest suit or dress is also acceptable – especially if you go with the Norwegian colour-scheme of red, white and blue. At the very least, pop a ribbon on yourself. Norwegian flag. Get yourself a Norwegian hand-waving flag and wave it all day. Swap arms if you get tired, place it in your pocket or bag if you absolutely cannot wave any more – but remember – the flag must never ever point downwards (treason!). Say ‘Gratulerer med dagen‘ (congratulations) to everyone. Practice your straight back and patriotic face for all the singing of ‘ Ja vi elsker’. Eat ice cream. And hot dogs (pølse). Fancy joining us for brunch in Southwark Park (London) this Tuesday? Pre-booking only – for bubbles and a lovely spread of freshly made 17. mai treats. If you have any questions do give us a call on 0207 998 3199 or email shop@scandikitchen.co.uk and we’ll be happy to help.